Box Kites Over Lebanon, USA. Sadly, this was going to be the last outing to "the park" in Lebanon so I wanted to do something special in view of this. Since then, we have moved from the middle of the Willamette Valley to Shedd. Yes, Shedd is the actual name of the town. It is also ground zero for the grass seed capitol of the world! I have not found a place to fly just yet, but it's very flat and windy out here. It's just perfect for kite flying. Back in Lebanon, I chose to bring my MBK Barn Door, my Rhombus Box kite, and my Peter Lynn Box kite. I could tell right off the cuff that it was far too windy for the Barn Door, but just right for the box kites. I only had an hour to fly so I quickly rigged up my P.L. Box Kite for a flight. The previous night, I had made a three legged bridle in place of the single attach point that the plans called out for. This seemed necessary after my KAP incident at the Oregon coast where I crashed my video camera into the beach sand at about 25 mph. It's OK, in fact it was still recording when my lovely wife, Sarah ran up to it. Unfortunately, this kite has been sitting for over a year since then partly because of it's complexity, and the bridle issues which plagued it. I wanted to fix it once and for all so I made a three legged bridle out of monofilament fishing line. It only took half an hour to complete it and test it outside. Once it was put together at the field I adjusted the bridle for the prevailing medium high winds, but I was unable to get it to climb the way it should. It would just wander around in the eye of the wind at a very low line angle. After a few moments of this nonsense, I was ready to scrap the new bridle and hook up to the lower attach point for a good flight with my P.L. Box kite. Maybe I will get the three legged bridle going when I have some more time to play with it. As I expected, it worked, but once again it leaned to the left just like before. Nevertheless, I was happy to see some vibrant red COLOR up there for a change! Clear kites get kinda boring after a while. The leaning wasn't so bad that I had to do something about it so I just left it up there. I did have to let out some line at one point to keep the kite from getting eaten by a tree. Other than that, it was a fine flight up to about 150 feet. It was at that point when the wind increased to at least 15 mph which is not too much for the kite's spars, but certainly too much for my well worn and abused 50 pound line! It was also at that point that I realized I was not wearing my leather gloves so I was limited at how fast I could bring the kite down. I was pretty concerned about losing this kite because of the time and effort which I had poured into it's construction. I doubt it would have floated all the way across the park and into a stranger's back yard in the event of another line breakage, but I was still bringing it in as fast as possible. The P.L. Box kite was pulling very hard by now and I just wanted to get it down safely without breaking it in the process. A blessing in disguise came when one of my inferior pine splice joints broke at about 100 feet. Oak would be a better wood choice. In fact, I have already successfully tested 3/8" oak sleeves on my MBK Multi Dowel Barn Door Kite. My camera just happened to be rolling when the splice joint broke so I got that drama on video. Although it ended with another broken splice, I was still very happy to see this kite back up in the sky where it belongs. This hobby would get boring pretty fast if nothing ever went wrong. It sure looks good sitting up there with that unorthodox shape! I even got some looks & pointing arms from the people who always watch me from their front porch. Last up was my Rhombus Box. This was sure to be an exciting time since it was in a very fresh breeze that even threatened the integrity of this box kite. Rigging was fast since I have rigged this kite several times in the last few weeks. Up, up and away it went pulling about 15 -20 pounds as always. 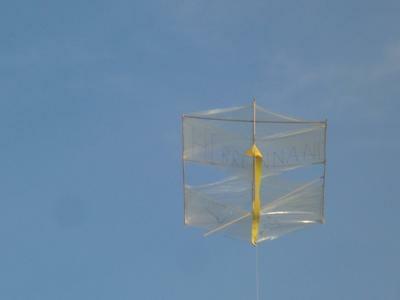 Once it reaches altitude, this kite is almost on rails. It's a blast to watch it rise nearly straight overhead. This time, the line angle was about 75 degrees and straight as an arrow. After a while, I had some issues with my lower sail coming loose, but the Rhombus Box still flew just fine. I only landed for cautionary reasons. This was a great outing with lots of exciting events and surprises. 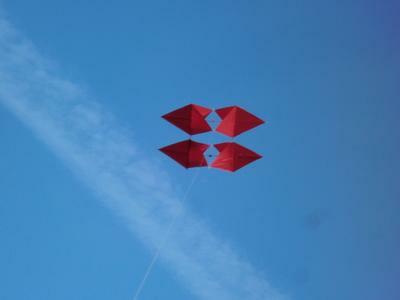 I think my next project will be a very large 8 foot Rhombus Box kite that I can do KAP with. I may even build a P.L. Box Kite with a 12 foot wing span along with a much smaller one that can be built using 48" spars and .7 mil plastic sails. It will be MBK materials friendly which means it will be much more portable and affordable than my current six foot P.L. Box. I need to get 1000 feet of 150 pound string before I do any more building. Comments for Box Kites Over Lebanon, USA. Clear kite? My new favorite color. After seeing your colorless Boxer, I decided I would try it out with a tetrahedral kite. I wanted to make her as close to invisible as possible, so I painted the bamboo baby-blue, went to WallyWorld and picked up some thin clear plastic for tablecloths (Cheap and very durable). It was a great idea, but ... My kite wasn't so durable. One question please: what to use to bind spats together? Zip ties never again. It's certainly good to have a Box or 2 in the collection, resulting in more flyable days during the year! The latest MBK design, the Multi-Dowel Box, is great in 30 kph winds. One day soon it might get a try in even stronger winds.